“I mean if you could bottle it…”. Derek McEndoo is talking about the sound of his favourite church bells. Dublin.ie caught up with him to discuss all things bell ringing and, in particular, we wanted to find out about the bells at St. Patrick’s Cathedral, the National Cathedral of Ireland. He just happens to be the Ringing Master at St. Pat’s. Yes, Ringing Master. We’re talking to the right man and he’s been ringing for over fifty years. Derek is very quick to point out that he was a young starter. Dublin is full of sounds – sounds that have helped to build the character of the place. Some have gone (think: the old tram system, traffic on Grafton St, the old docklands). Some however are thankfully still with us like the bells at St Patrick’s. They have been ringing out over Dublin for 800 years. In that time the bell tower has been burned to the ground, rebuilt, briefly became part of a courthouse, and was even blown down in a storm all the way back in 1316. Shockingly, Derek’s favourite bells aren’t the ones in St. Pat’s, or even in Dublin for that matter. That particular honour goes to the bells at the Redemptress Church in Limerick. Why are they his favourite? “There’s just something about that particular audible quality” says Derek. For us, it’s not so much a matter of favourites. It’s more the soundscape of the city. 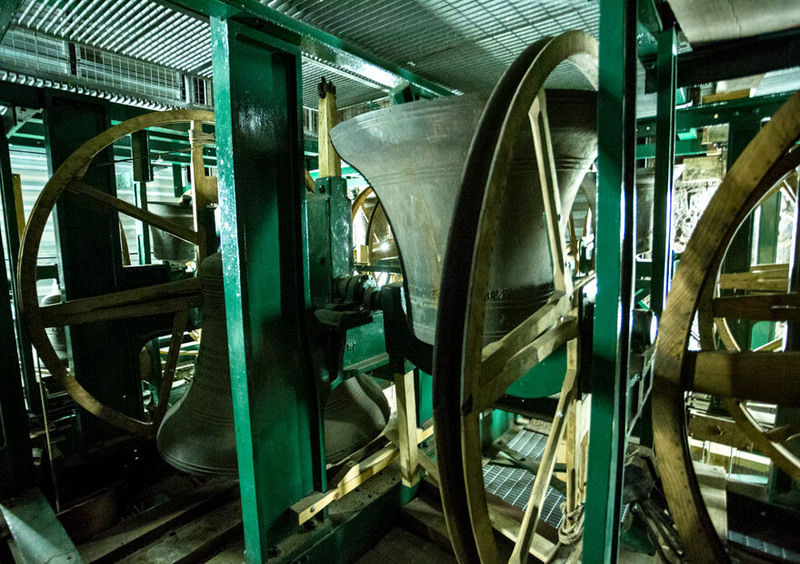 It’s about the sounds of home, and how the bells of St. Pat’s are a part of that. There’s just something about those sounds together. How do the bells make that sound? Derek explains to us that it’s something called Full Circle Ringing, dating to the 17th Century. The bells sit upside down. Then when they’re rung, they go 360 degrees in one direction, and then 360 degrees in the other which allows the ringers to control the sequence of the bells. It lets you create a melody. This method is almost completely unique to the English-speaking world. Twelve bells can be run at the one time, each bell the note of an instrument. And can just anyone become a bell ringer? Incredibly, the answer to that question is yes. Derek stresses that “musicality is not an absolute requirement. It’s more of a sense of rhythm you need to be able to control a bell.” Indeed if anyone reading this wants to try their hand at this noble hobby, just get in contact. If you ring them up, you’ll find an extremely enthusiastic Derek at the other end of the line. Of course bells were originally there to tell people to attend church services, but their purpose has since evolved to communicate time. In that respect church bells are unique. The bells at St. Pat’s in all their years have presided over the city, and have presided over its time. Countless people have lived their lives with those bells ringing out, and have lived their lives to the time set out by them. Derek met his wife in the belfry and now his daughter rings there. It isn’t uncommon for families to ring together. More people will ring those bells in the future however. Life will surely go on and those bells will ring.